← Win a Modelling Portfolio! 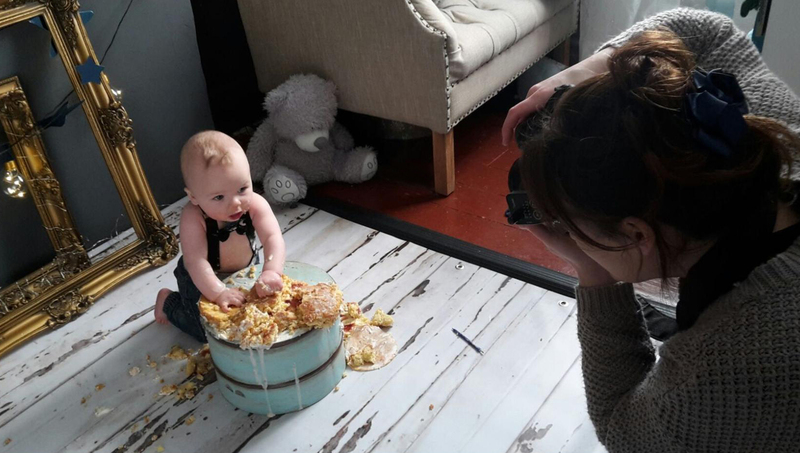 So how do you take the stress and mess out of a cake smash photoshoot?…. well, we are very excited to add a new twist to our cake smash photography in our Southport studio….. We like to call it Smash and Splash! It’s a cake smash followed by a lovely jubbly bubble bath! Our first little model was this cutie pie, Sonny. Mum, was a bit apprehensive as of course, with all children, you never know how they are going to perform, what to bring? what to wear? all of these questions we could answer and put mum at ease. Once mum felt more prepared she couldn’t wait to capture a magical milestone and let her baby get really messy with a yummy cake then leave us to take out the stress and clean up with a bubble bath and fluffy towel, allowing us to capture some more cute pictures. On the day, mum and Sonny arrived at our family friendly, photography studio in Wesley Street, Southport. Thankfully for mum, Sonny was in a fantastic mood! (he must have known about the cake) The photoshoot lasted around an hour and we had a full, tired, giggly little one and a happy mum. Mum was especially excited that we would be sending a picture to the Southport Visiter Newspaper, as part of our famous Birthday Club! We are an established photography studio in Southport town centre, with a large and spacious studio space plus a separate reception area in which we have had many a natter and brew helping you choose your pictures. We like to see ourselves as a home from home and are very down to earth… we want you to feel as relaxed and comfortable as possible. Your session is tailored to suit you, and we work very hard to make it personal and memorable. For £30, it would include the time for cake smash photographs (bring your own cake) and then a lovely warm bubble bath. You can choose a 10×8 from the session, a goodie bag with some surprises from our friends at Fab Party Bags , a picture in the Visiter … PLUS the chance to buy one of our fantastic photography packages. This entry was posted in Uncategorised and tagged 1st birthday photoshoot, 1st birthday photoshoot southport, Baby photography, Baby photography lancashire, Baby photography southport, birthday photoshoot, birthday photoshoot southport, cake smash, cake smash northwest, cake smash photographer northwest, cake smash photography, cake smash photography southport, cake smash southport, photographers southport, smash and splash, southport visiter. Bookmark the permalink. 3 Responses to Smash and Splash! I was pretty pleased to uncover this website. I need to to thank you for your time for this particularly wonderful read!! I definitely really liked every little bit of it and i also have you book marked to check out new information in your blog.